My name is Joe Junion but I like to go by Jomusky when it comes to fishing! This site is an excuss I used for learning how to build a web site. 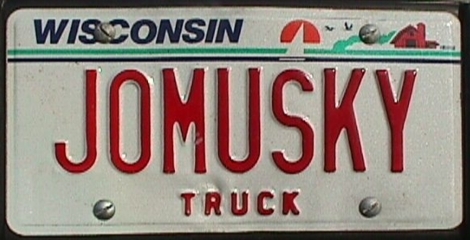 It is also a product of my pursuit of musky fishing. 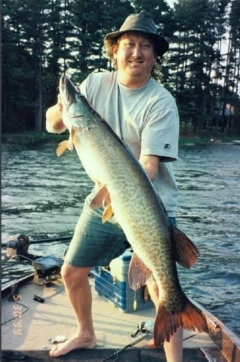 Musky fishing is much more then a hobbie, it is a way of life! My loving family and I live in Combined Locks, Wisconsin. I was born in 66' and have lived in the Fox Cities area all my life. I make my money for fishing as an Electro-Mechanic. My job includes repair of electric motors of all sizes, pumps, gearboxes and many other machines! I am the president of the C & R Musky Club of Dale, Wisconsin. Not my largest Musky anymore, but a healthy 47 inches and estimated at about 30 pounds. I caught it while fishing with my brother and his father-in-law on the Manitowish Chain of Lakes. A very girthy fish for Memorial Day weekend! As always, she was released to bite another day. I am very proud to say a musky has NEVER been kept in my boat! 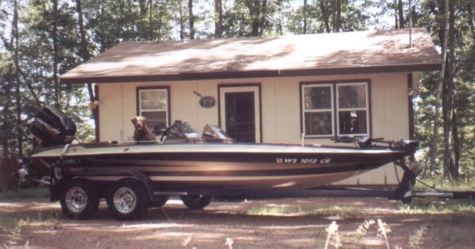 My Paradise: a Stratos PRO201 powered by a Mercury 200 EFI with eager fishing buddy Mercury ready to go. Pictured in front of the cottage my dad and I own. It is located in a quiet area off the water by Minoqua.